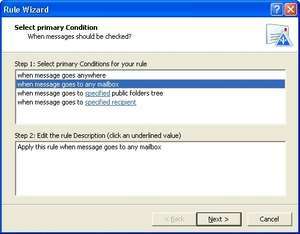 Program for creating and managing Microsoft Exchange Server and Small Business Server 2000/2003 server rules for processing incoming messages. The product provides much more flexibility and functionality than server rules created in Microsoft Outlook, supports any message types and uses a completely new technology in its work. MAPILab Rules for Exchange 2.4 is a shareware program and can be used as a demo to try the software until the free trial period has ended. A full version of the program is available after the trial period ends. For security reasons, you should also check out the MAPILab Rules for Exchange download at LO4D.com which includes virus and malware tests. Additional screenshots of this application download may be available, too.